Generally, Google has provided a Google Maps library for Android. This make it more convenient and faster for android app development. Also Google Place API. But if you want to show route navigation on Google Maps. You have to using Google Maps Direction API that doesn't provide as an android library. It's burdensome to call it with simple HTTP operation and get response data in JSON or XML format. because you have to digest these information by yourself. To more convenience, I write a library to make it easier to using Google Maps Direction API. At least until Google provide a Google Maps Direction library for android. Google Direction Library was created to use with Android and related with Google Maps. So this library contain with Google Play Service (Maps) dependencies and also with Retrofit 2.0, GSON and Parceler. 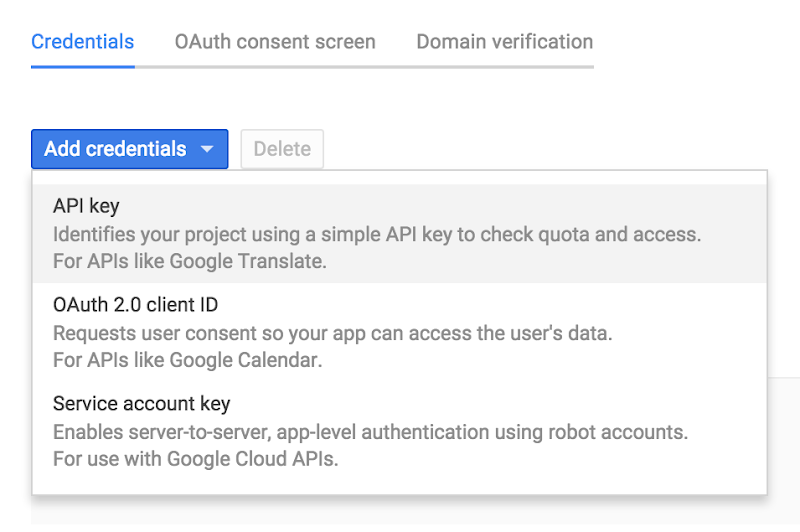 API Key from Google Developer Console is important for using this library. Otherwise it's sound like an API Key of Google Maps for Android API. But Google Maps Direction API is require a Server Key, not and Android Key. 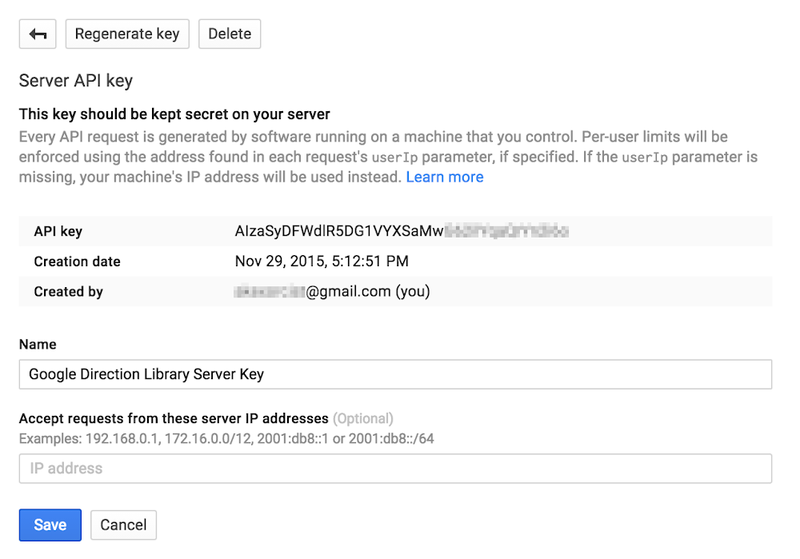 Don't forget to enable the Google Maps Direction API before get a new server key. To get a Server Key. It's same with Android Key, but you have to choosing a Server Key instead. Unnecessary for name of key, you can set any name. And leave the IP address field empty. Add dependencies for this library into build.gradle on your project. The commands are very simple. This is a most simple example code. origin An origin point in LatLng class that you want to get direction from there. destination A destination point in LatLgn class that you want to get direction to there. The callback is contain with 2 methods, Success and Failure. If receive response from server successfully, onDirectionSuccess method will called. But if something problem was happen, such as internet unavailable or connection timeout, onDirectionFailure method will called instead. So you have to diagnose a problem from Throwable instance to solve a problem or show message to user. Besides these important methods that required to request direction information, Optional parameters are also available. Just call after to and before execute method. Define the transport mode by using static value from TransportMode class. The route will vary by transport mode. Bicycling is available for some place and Transit will combination of transit and walking (Example : walk to take a transit bus). Define the language of response data from Google Maps Direction API by using static value from Language class. Response data will be a define language. But not always, define language should be related with the country of request location. Define the unit of distance in response data by using static value from Unit class. METRIC Specifies usage of the metric system. IMPERIAL Specifies usage of the Imperial system. Define in which way should be avoid by using static value from AvoidType class. INDOOR Avoid indoor steps for walking and transit directions. This method can define more than one preferred type. Just call this method again with avoid type that you want to add. Because this method is adder not setter. Define the transit mode by using static value from TransitMode class. BUS Prefer travel by bus. SUBWAY Prefer travel by subway. TRAIN Prefer travel by train. TRAM Prefer travel by tram and light rail. RAIL Prefer travel by train, tram, light rail, and subway. This method can define more than one preferred mode like the avoid method. Define the response data can be more than one direction. Normally, the Google Maps Direction API will be calculate for the best direction way. But also can be calculate for multiple direction and send to client if request with alternative route. All of these methods can be set simultaneously. The response data will be in instance of Direction class. But it can be unsuccessful at anytime, so you have to check it before using. In the Direction class, can get status by call getStatus method. All status type can check with static value in RequestResult class. NOT_FOUND Origin or destination or waypoints could not be geocoded. ZERO_RESULTS No route could be found. OVER_QUERY_LIMIT Service has received too many requests from your application within the allowed time period. REQUEST_DENIED Service denied use of the directions service by your application. Maybe cause of invalid API key. UNKNOWN_ERROR Directions request could not be processed due to a server error. The request may succeed if you try again. If you want checking for OK status only, you can use isOK method. Direction from origin to destination location, called Route. 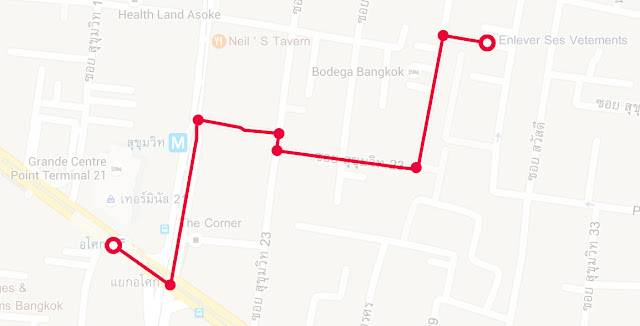 And Google Maps Direction API can provide more than one route if you request for alternative route. Google Maps Direction API can request for visiting some place in once navigation. Example : you want to go to eat some food at restaurant and walk around shopping mall a few minutes, then go to work in your office. The place between direction called Waypoint. Unfortunately, my library doesn't supported for waypoint now. But I will add this feature later. The direction way from one location to another location, called Leg. If your direction have many waypoint. The leg will increase as the waypoint. But my library doesn't supported for waypoint yet. So leg in response direction from my library will have only one leg. In the navigation, it should have an instruction on the journey. E.g. "Straight forward", "Turn Left". That's called Step. And one route can be contain with many steps by depending on the complexity of the route. The image above, there are 7 steps. The result will have at least 1 route if response status is OK. (Or multiple route for alternative route request). The Route will be in the form of array. And 1 route will have 1 leg (No waypoint). The Leg also in the form of array and contain with step array. Because 1 leg can be contain with many step. So you have to retrieve the Step in array. In Step instance, you can retrieve start location and end location of it directly by using getStartLocation and getEndLocation then using getCoordination method. Location data will be in LatLgn instance. But it's too boring, right? because you have to retrieve all of these value with for loop then use as needed later. So you can retrieve them in LatLgn array directly. Just using getDirectionPoint method. For some transit direction. If the Step instance is walking direction, it can be contain with Step inside. Because the transit direction is combination of transit and walking. To determine the step, using getTravelMode method. And compare result with the static value in TransportMode class. If you want to retrieve the location of the each step. For the total distance and duration of the route. Retrieve the distance and duration of the each step. Navigation instruction is available by retrieve from Maneuver instance of the each step. HTML instruction also available too but don't forget to convert them from HTML format to show in your app. To draw a direction route on Google Maps. It must be in PolylineOptions instance. You can convert the route into PolylineOptions by retrieve Leg instance from Route instance before, then convert it by using DirectionConverter class. The 5 value is the width of line in DP unit and Color.Red is the color of the line. For transit navigation, you have to retrieve Step in array, then convert them into PolylineOptions in array like this. The transit line is red color with 5dp width. The walking line is blue with 3dp width. Each step can retrieve the transit information with TransitDetail instance. Transit information contain with many detail. So you can using these data to show to user. In version 1.0.5, some issue was fixed and GoogleDirectionConfiguration class was added for customize something. This configuration will set to false by default. Call this method only once before request the direction. If you want the source code of this library. Get it on GitHub. It's open source for everyone.